Dear Fatty - by Dawn French(Autobiography). This book came out just before Christmas and there was a lot of hype about it being fabulous, so I was desperate to read it. My friend Jo over at Crafting and Allotmenting kindly lent it to me and I devoured it very quickly. Many of my overseas readers probably won't have a clue who this lady is, but over here she is a much loved British icon. Dawn French is part of one of our most longest serving comedy duo's French and Saunders who have been making people laugh for 30 years now. Jennifer Saunders had a hit programme with Absolutely Fabulous, which I think was aired in America. Dawn has also had a very successful acting career, her most famous role being Geraldine Granger in the Vicar of Dibley, which is one of those comfort TV programmes that you can watch over and over again, a bit like Friends, Frasier and even Only Fools and Horses. Dawn is also married to another very famous comedian, Lenny Henry, who figured quite heavily in my childhood viewing in the late, great Tiswas. Find me a 30+ British person who never watched Tiswas on a Saturday morning whilst growing up, and I will throw custard pie at them! Only joking! Dawn's autobiography was as good as people said it was. It had me laughing so much, that my settee would not stop shaking and my husband refused to sit next me. She comes across as a warm, lovely,kindhearted person, who you would just love to know and have as your best buddy. She has written the book in the form of a series of letters to different people who are important to her. A lot are addressed to her father who committed suicide when she was nineteen. She also writes a lot to Fatty, who is her comedy partner Jennifer Saunders, who isn't large at all. I loved this book completely, I loved reading about their obsession with getting Madonna on their show for the last 30 years, always being turned down. I loved reading about their Comedy Strip days which were a big part of my television viewing whilst growing up. I loved that they wanted her in Mama Mia, but her singing was beyond awful! I hav included some pictures. The top one shows Dawn with her husband Lenny. The next one show Dawn as Geraldine Granger and the third is a picture of her with her comedy partner Jennifer Saunders. If you are looking for a warm, light hearted read, I would definitely recommend this book. You can post your link to this review or this review on the challenge blog as a new post.Can you send me an email? piper oliver avram (at) yahoo (dot) com? Thanks! That sounds like a really fun read! 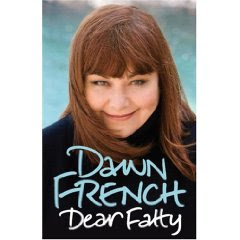 I do know who Dawn French is and I am going to have to see if this book is available over here in the States. 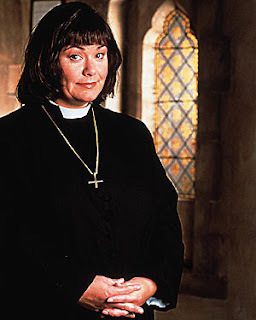 I love Dawn in Vicar of Dibley - I'm adding this to my wish list.